KDF has a long history of partnership with the Division of Conservation's annual seedling giveaways. Two such giveaways happened in the West Region's Butler and Ohio counties. Over a couple thousand of our seedlings were planted and given away at the Northern Kentucky Urban & Community Forestry Council’s Reforest Northern Kentucky at Big Bone Lick State Park. 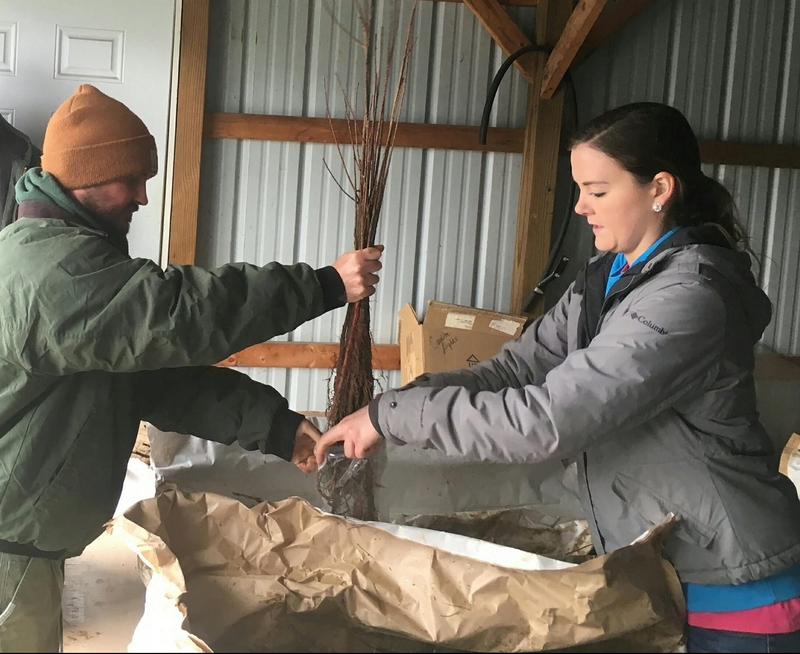 One of the most popular programs of the Kentucky Division of Forestry (KDF), is the state nurseries and tree seedlings program. With a target of growing 1.5 to 2 million seedlings each year, the division is doing its part to help reforest the Commonwealth. With two seedling nurseries in Morgan and Marshall counties, the KDF is able to offer over 50 species of trees native to Kentucky, with the exception of the blight resistant Chinese chestnut. Some of their most popular varieties of trees are the dogwood, redbud and the sugar maple. The nurseries also have seen bottomland hardwoods go up in demand. Swamp white oak, pin oak, bur oak and over cup oak have become remarkably popular according to Gracey. Currently, feedback from the community has foresters exploring requests for basswood. Seed availability also strongly dictates what trees will be grown and offered to the public. Central Region Chief Forester Robert Bean at a tree giveaway in Hart County. More trees in the ground is not only good for the Energy and Environment Cabinet, but it also has countless environmental returns such as enhancing wildlife habitat, improving urban areas and reclaimed surface mining sites. Not to mention the economic benefits of cleaner air, water and lower utility bills for the citizens of the Commonwealth. According to Gracey most of KDF’s free trees are given away around Earth Day and Arbor Day to raise awareness of the earth and how important each and every tree planted is. The trees, which range from a year old to two years old, grow faster than you think, but are species dependent, according to Gracey. A recipient may want to discuss a specific variety with a regional Forester at the time of purchase, but Gracey said there is a motto that the KDF does go by. Seedlings are also available for purchase in the KDF nurseries until the end of April for packages of 10 seedlings for $35, 50 seedlings for $55 and 100 seedlings for $70. Nursery seedlings are priced quite reasonably, due to the fact the KDF nurseries are the only ‘bareroot’ nurseries in the state. This means that no dirt is attached to the roots of the seedlings. This allows them to be easily planted with a mechanical tree setter, or planting bar to get many of them in the ground quickly and efficiently and also allows the seedlings to be shipped. Seedlings may be purchased by contacting your local Regional Office. More pricing and information may be found at http://forestry.ky.gov/statenurseriesandtreeseedlings/Pages/default.aspx or on the nursery order form itself at http://forestry.ky.gov/statenurseriesandtreeseedlings/Documents/Seedling%20Order%20Form.pdf. KDF Regional Offices points of contact. Please do not contact the nurseries.